6. Parents who have lost children through suicide want you to say their child’s name and talk about their child’s life. During our interview time, Mike mentioned that his son is one of three young men who had died untimely deaths in their family. Mike tragically lost two nephews. One was killed in a car accident and the other was lost when a tornado hit a high school in Enterprise, Alabama in 2007. Mike said that when he is around friends and family, people will freely share memories of the other two boys, but will seldom mention his son. There may be various reasons, but whatever the reason it reveals a common problem, people don’t know what to say. Mike looked at our congregation on that Sunday and said, “Say their names. Parents who have lost children through suicide want you to say their names.” People who have lost loved ones through any manner of death find healing through the sharing of memories and the recollection of stories. For those who have lost someone through suicide, it is just as healing for them to hear those stories and to have their names mentioned and missed. Family members and friends don’t want you to ignore their loss, they want you to talk about it, ask questions, and share memories. The freedom of conversation lets them know you are with them in their trial. 7. Grief after suicide is different than grief after other forms of death. No one survives life. Death comes upon us in various ways and at various times. Some die young. Some are very old. Some lose their life after long battles with sickness or disease. Some people’s bodies just break down. Some people are lost suddenly and tragically in accidents. There is a common patter of grief shared in almost all of these instances, but for those who lose someone through suicide, the process of grief takes on a different form. After the death of a loved one grief is often objective. We wonder if our loved one suffered in their final moments; or perhaps we wonder what their life would have been like if they were allowed to continue living. With suicide grief is greatly mingled with guilt. Grief takes on a much more subjective tone as loved ones struggle to answer a seemingly impossible question; why? Many times there is a great deal of blame. People may blame themselves or one another. Suicide often brings with it emotional strain that tests friendships, familial bonds, and even marriages. With suicide there is confusion and anger at the one who took their life, but the person is no longer there to help bring resolution. 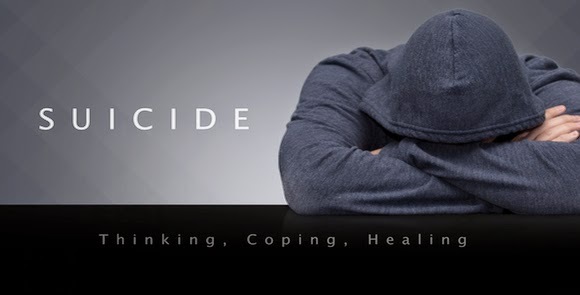 Suicide is not only the end of the conversation, but it as stated in a previous point, it is the end of possibilities. For those contemplating suicide, Mike mentioned that one often thinks his or her death will bring relief or resolution to a problem. Mike said the reality is otherwise. He said that his son struggled with depression and other problems from the time he was a teen, but those problems were no comparison to the problems his suicide has brought upon his family. Mike said his son’s death was only the beginning of problems; and those problems continue even 11 years later. Grief after suicide is severe. For those contemplating suicide, the toll on one’s family needs to be considered before you make a tragic mistake. For those helping a loved one heal after suicide, it must be understood, this will be a long road full of unanswered questions. In this case we may not be able to offer solutions, but to do what the Bible says and merely to help bear one another’s burdens and thus fulfill the law of Christ (Gal. 6:2).